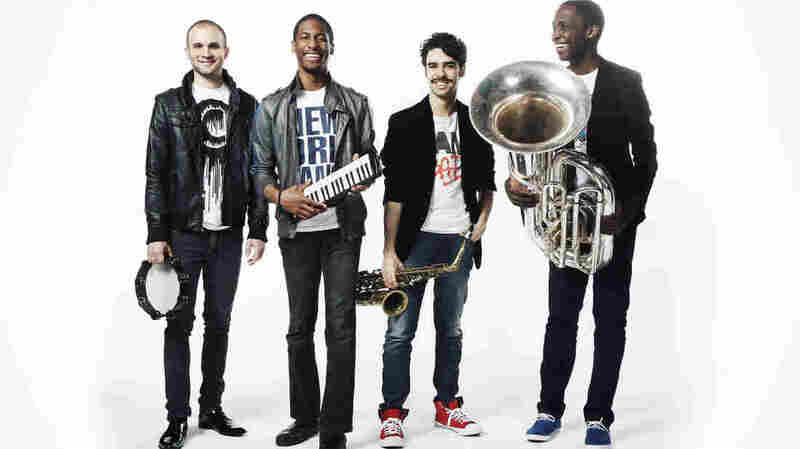 Bringing Jazz On Walkabout: Jon Batiste And Stay Human Host Rachel Martin is joined by pianist Batiste and his band, who hope to make jazz transcend genres and generations, as they play live at NPR's headquarters. Jon Batiste (second from left) and the Stay Human band. "It's Alright (Why You Gotta)"
Pianist Jonathan Batiste was born and raised in New Orleans as part of the Batiste jazz family dynasty there. He was playing with the family band by age 8. Eventually he took his talents to Julliard, and that's where he met the rest of Stay Human: Joe Saylor on the drums, Ibanda Ruhumbika on tuba and Eddie Barbash on alto sax. The band is all about avoiding formality — so with them, Batiste goes by Jon — and making jazz as accessible as possible. If that means fusing it with funk or rock or pop, no problem. Ditching the grand piano for a portable piano-harmonica hybrid? Sure. Playing parades on the streets and in the subways of New York? Of course. Jon Batiste and Stay Human have a new album called Social Music, and they recently met up Weekend Edition Sunday host Rachel Martin to perform in NPR's Washington, D.C. studios. Hear the music, and their conversation, at the audio link.